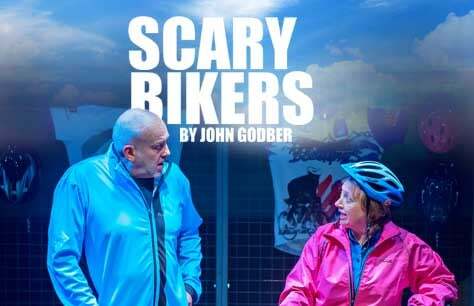 John Godber’s The Scary Bikers cycle their way into London’s West End. After their fateful meeting in a grief support group, retired miner Don and former teacher Carol thought they had finally found their soulmate. But when they decide to cycle across Europe together, treacherous paths bring them to the brink of despair and soon they’re just one pedal away from nipping their romance in the bud. Embark on this hilarious and heart-warming adventure, as the grieving new couple reminisce about the past, argue about the present and grow anxious for the future. As the pair cycle from Southampton to Bordeaux before ending up in Florence, you’ll be wishing you were along for the ride! The Scary Bikers cast features John Godber and Jane Thornton, a two-time BAFTA Award-winning and Olivier Award-winning duo whose 2017 indie film, Last Laugh, was a huge critical success. Now, their latest piece, The Scary Bakers, is set to take the West End by storm! The Scary Bikers tickets are on sale now at Trafalgar Studios 2 in London! John Godber’s amazing new tale of grievance and self-discovery is set to be among London theatre’s highlights! Book your tickets to The Scary Bikers now and gear up for the ride of your life!